Zynga has come out on top in a settlement with Brazilian developer Vostu over alleged copyright infringement in various Vostu games. Back in June, social gaming behemoth Zynga sued social gaming startup Vostu over claims that Vostu had violated its copyrights with several games that ripped off Zynga titles. And yes, I know that Zynga isn't exactly a bastion of creative and original thinking either, but this stuff was pretty blatant. A month later, Vostu countersued, claiming that Zynga was actually the one ripping off Vostu games and was using the lawsuit to muscle out competition, but in August a Brazilian judge imposed an injunction against Vostu and gave it 48 hours to get four of its games off the internet or face fines of roughly $13,000 for every day that they remain online. The two companies have now settled their differences in both the U.S. and Brazil, and in the end it was Vostu that was forced to back down. 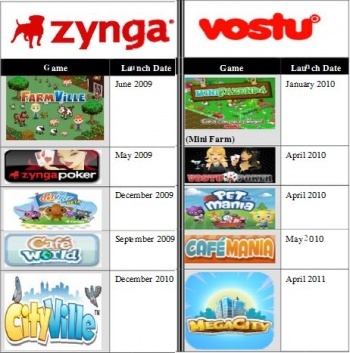 "As part of the settlement, Vostu made a monetary payment to Zynga and made some changes to four of its games," the two companies said in a joint statement to Gamasutra. "The parties are pleased to have settled their disputes and to now put these matters behind them." It's not exactly a huge win but it's still some much-needed good news for Zynga, which has had a bit of a rough ride lately, with criticism of its corporate culture, sagging player numbers and even some public guffola from Take-Two CEO Strauss Zelnick. Zynga also finally got around to floating an IPO a few days ago, putting its value at $1 billion.